To Cite: Amiri S, Asilian Mahabadi H, Mortazavi S B, Ghanbari Kakavandi M. Investigation of Safety Climate in an Oil Industry in Summer of 2014, Health Scope. 2015 ; 4(2):e26071. doi: 10.17795/jhealthscope-26071. Background: Safety Climate is an issue that has received much attention in recent years. Evaluation of safety climate in a workplace gives us good information about the safety organization situation. Safety climate is a leading indicator in preventing accidents. Objectives: The aim of this study was to evaluate safety climate and investigate of association between safety climate and demographic factors in an oil industry in summer of 2014. Materials and Methods: This cross-sectional descriptive-analytical research was conducted in an oil industry during summer of 2014. Sample size was 97 and used the Loughborough University Safety Climate Assessment Toolkit, which assesses safety climate in nine areas. Scoring in each area was done in Likert scale. Data analyzing was done after data collection. Results: Final scoring was done on a scale of one through ten. The highest scores were achieved in personal values (mean score, 8.7 ± 1.36) and lowest scores were achieved on the personal perception of risk (mean score, 5.4 ± 1.26). The mean safety climate score were 6.8. Significant associations were found between safety climate and age (P = 0.01), between age and management's commitment to safety (P = 0.02), and between marital status and regulations and guidelines (P = 0.04). The association of other domains with the age, education, and marital status were not significant (P > 0.05). Conclusions: Based on of this study, management has an important role in creating a positive safety climate. Individual characteristics can influence thee safety climate. Management commitment to safety is an important factor in the success of safety programs. Each year, a number of people are killed or injured because of work accident. In the United States in 2011, 4600 workers were killed and nearly three million workers beard important injuries at their work (1). Accident researches after Chernobyl nuclear disaster in 1986 have shown importance of organizational and cultural factors in accidents (2). Safety culture, as component of organizational culture, focuses on organization values and presumption about safety and human resources (3). In recent years, safety measures have been developed to avoid safety measures that focus on integrated retrospective data or lagging indicators such as fatalities, lost time rates, and accidents into indicators called “leading indicators” such as safety audits or safety climate surveys (4). Safety climate refers to measurable elements of safety culture such as management behaviors, employee perception of safety, and safety system (5). Safety culture and safety climate can overcome many conventional measurements restrictions and therefore, enable to measure reality. Safety climate questionnaire is used for measuring workers' perceptions of management commitment to safety, distinguishing safety zones that need to be intervened, identifying ways in safety performance of the organization, and appointing a base for safety levels in different organizations (6). Although safety culture and safety climate are two different terms, sometimes they are used interchangeably in previous studies and daily work (7). In comparison to safety culture, safety climate focus is linear and reflects the underlying culture of an organization and a work group (8). With safety climate measurement, we earn information about climate level and its strength in an organization (9). Organizations with vigorous safety climate have low injury rate because of effective safety climate and management commitment to safety (10). A study done in a chemical industry in South Africa showed the importance of management commitment to safety (11). Most existing researches confirm the association between safety climate and leadership. This communication, as a process of social learning that finds and shares information with the members of their team, is used to interpret enterprise environments characteristics (12). Many studies have shown the association between safety climate and safety outcomes (13). Given the above information and the importance of safety climate assessment in an organization, especially in high-risk industries such as the oil and gas industry, this study was conducted to assess the safety climate in the summer of 2014. This cross-sectional descriptive-analytical study was done in an oil industry in one of the Iranian towns in summer of 2014. With use the Cochran formula, confidence coefficient of 0.05, sample size was calculated at 97 and with probability loss of about 20%, 120 personnel were selected randomly among various job groups with the same number of people in each job group (workers, supervisors, and technicians). To assess the safety climate, we used the Loughborough University Safety Climate Assessment Toolkit, which includes 43 questions (with Likert scale), validated by researchers with Cronbach’s alpha 0.8 (14). This safety climate questionnaire measures safety climate in nine domains. 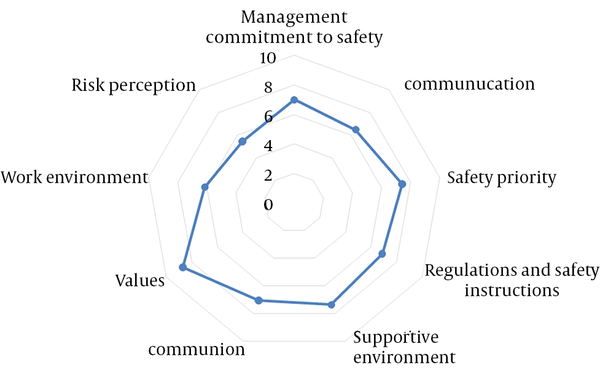 Management commitment to safety domain consists of seven questions; communication, five; safety priority, four; regulations and safety instructions, three; supportive environment, six; communion, three; values, five; risk perception, four; and work environment, six. Scoring was as follows: 1, absolutely agree; 2, agree; 3, not agree not disagree; 4, disagree; and 5, absolutely disagree. And questionnaire application is to the oil and gas industry that scores 6 points is considered as moderate. The questionnaire was administered to the staff through semi-supervised self-implementation method. Because data did not have normal distribution, Spearman’ rho test was used to examine the association between demographic characteristics and safety climate. In addition, we used the descriptive statistics. Excel 2007 and SPSS 19 (SPSS Inc, Chicago, Illinois, the United States) were used for data entry and analysis, respectively. Of the 120 questionnaires distributed among employees, 97 questionnaires were returned (response rate 80%). Respondents mean age was 37 years, mean experience was 14 years, 89 respondents (91.8%) were married, 12 (12.3%) had education under diploma, 58 (59.8%) had diploma education, and 27 (27.8%) had diploma and higher education (Table 1). The final average safety climate score was 6.8. The association was statistically significant between age and safety climate (P = 0.01) as well as between management commitment and age (P = 0.02) (Table 3). A total of 7 questions related to management commitment. However, there was no significant association between management commitment with work experience, marital status, and education (P > 0.05). Marital status had a significant association with the regulations and safety instructions (P = 0.04). This domain was measured with tree questions. Other domains had no significant association with demographic characteristics (P > 0.05). Personal values achieved the highest scores (mean, 8.7 ± 1.36) and personal perception of risk achieved the lowest score (mean, 5.4 ± 1.26) (Table 2). The present study indicated that the association between age and safety climate was significant. Safety climate survey by Andersen and colleagues (2011) in Danish Industries’ employees revealed that the effect of age on judgment and job stressors or false expectations was higher among younger workers (15). Moreover, study of Khandan et al. showed a significant association between age and safety climate (16). In addition, management's commitment had significant correlation with age, which could indicate that aging has positive effect on attitude to management role in safety. In study of Shokohi et al, this association was significant (17). In this study, association between work experience and education with none of the domains was significant, which could be due to the effect of work experience and education on safety attitude shaping. Furthermore, this association was not significant in Adl et al. study (14). On the other hand, study of Gyekye et al. indicated that the association between safety climate and work experience was significant (18). There is a significant association between marital status and regulations and safety instructions. Married people seem to focus more on rules and regulations in the workplace. Studies performed on the interior of this association are not significant. This association was also significant in a number of studies. In some studies, the association between safety climate and demographic factors was not significant. The difference in results may be due to differences in the workplace, working conditions, and cultural differences. Although the effect of individual factors on safety climate differs in various conducted studies, its effect on the workplace atmosphere cannot be ignored. In addition, based on safety climate plot (Figure 1) personnel risk perception has the lowest score that indicated the attitude of personal toward risk was weak in this industry and this domain needs to be invigorated more. Personal values had a better situation among other domains that indicate safety had an important role in personal values. Other domains such as management commitment to safety, communication, regulations and safety instructions, and work environment also need to be improved. This industry should start plans to improve weak domains and strengthen other domains. In summary, workplace safety climate is influenced by various factors and safety management participation in safety programs will have a positive role in shaping positive safety climate. More studies in workplaces with different conditions and comparing the results will be useful in this context. This article was derived from Master of Science degree thesis in occupational health engineering, Tarbiat Modares University, Tehran, Iran. We express our thanks to Tarbiat Modares Occupational Health Department and HSE Affairs of Ministry of Petroleum for their collaboration. Authors’ Contributions: Somayeh Amiri participated in designing, performing, extracting, analysis and interpretation, statistical analysis of data, and preparing the manuscript. Hasan Asilian Mahabadi participated in study management and supervision. Seyed Bagher Mortazavi and Masood Ghanbari Kakavandi were study advisors. Funding/Support: This study was supported by Occupational Health Department in Tarbiat Modares University.